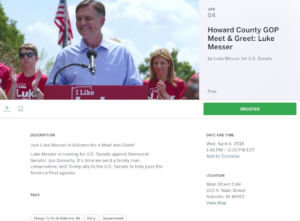 INDIANAPOLIS – Congressman Messer’s campaign claimed that he missed several campaign stops because he missed his flight from his home in Washington, but questions remain as to what he was doing outside of Indiana in the first place in the middle of a pivotal congressional recess. Congressman Messer was scheduled to have stops in Indianapolis and Kokomo this morning and early afternoon. George Myers, a reporter for the Kokomo Tribune, however, reported that he did not attend the Kokomo eventthat was supposed to begin at 1:45 p.m. today. When asked about his absence, Congressman Messer’s campaign said that the campaign had pulled the event because his flight from D.C. had been cancelled. However, no flight today from any of the three Washington-area airports into Indiana has been cancelled. It’s unclear why Congressman Messer was at home in Washington last night instead of on the campaign trail ten days into a congressional recess and with just over a month to go until election day. No recent public or internal poll of the Republican primary has shown Congressman Messer in the lead.